New three-pack of MERV 13 20x25x4 pleated air filters. Need to replace your whole house air filter? U.S. Home Filter offers this MERV 13 pleated air filter to replace your dirty, dusty existing filter. This three-pack of 20x25x4 MERV 13 pleated filters costs a lot less than purchasing new filters with a brand name on them. Our whole home filters are made in our own production facility in Missouri where we ensure each air filter is made to the highest standards. 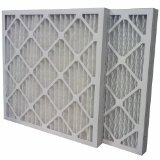 This filter has a MERV 13 rating, which is the highest rating available for whole home air filters. This means it stops and traps the largest amount of particles floating around your house, including pollen, dust, pollution, smoke particles, and more. 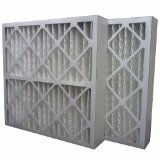 The higher the MERV rating means that these filters can help you to dust less frequently, and that the air in your home will be cleaner. Have you signed up for our Filter Change Reminder service yet? Dirty air filters can cost you extra money each month, as your dirty whole home air filter can reduce the airflow through your system, making it work harder, thus being less efficient. By signing up for our reminder, we’ll remind you when it’s time to change your filter, as well as when it’s time to order more 20x25x4 pleated air filters. Need to make sure this filter fits your system? Be sure to check the “Additional Information” tab to see specific details about these filters. If you have any questions, one of our customer services agents would be happy to help make sure you select the right whole house air filter to fit your system. Just give us a call and we’ll make sure you get the replacement filter you need!